Learn how to make a cute origami heart bookmark, which makes a great gift for Valentine's Day! If you love your book, give it a pretty heart bookmark! Show your book some love with this pretty origami heart bookmark! Give one to your Valentine this year, you can even write a love note on the inside. Start with paper that is thin but sturdy and preferably with the same colour on both sides. I used paper that was 15 x 15 cm with two colours for the tutorial. If you are looking for more Valentine's Day craft ideas, check out these Super Easy Origami Hearts, the famous Kawasaki Rose (for more advanced paper folders) or how about an Origami Heart Shaped Box? Making a present, you'll need a box to give it in, learn how to make a traditional origami Masu Box with this straight forward photo tutorial. This box can be dressed up with ribbon, and makes a chic gift wrapping option. 2. Fold the front flap under as shown. 4. Fold the right side of the front flap aligning with the vertical crease in the middle. 5. Fold the left side the same way. I found it easier to fold this way instead of folding them under straight away. 6. Open the front flap. 7. Reverse the last two folds underneath. 8. The bookmark is finished! You could use a bit of glue to secure the flaps, but it's fine the way it is. I like the back of the heart being longer than the front, but you could also do the same to the back. 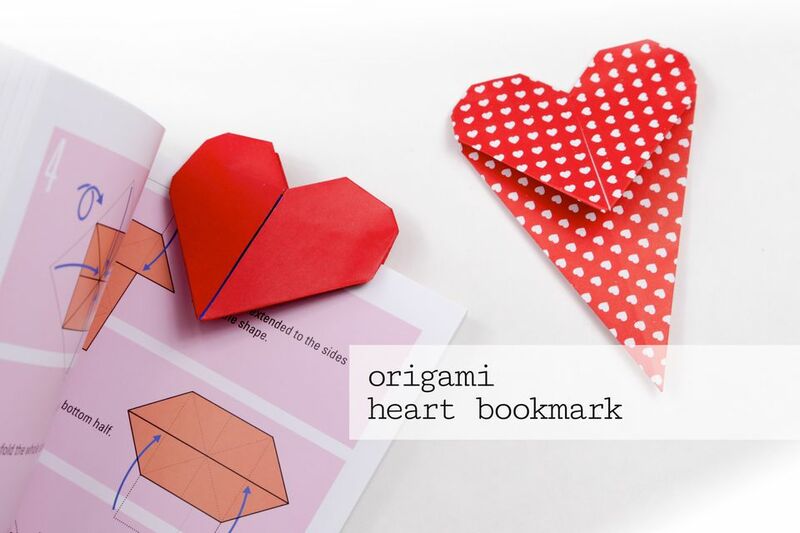 To make a super cute origami heart bookmark, use paper that's 7.5 x 7.5 cm!